Making Art in Cedar Key! Hello friends, As many of you know I am in Florida on Vacation. Only a few days left before we leave for home. 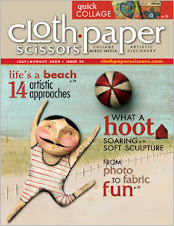 I need to get home and prepare and send off an entry to Cloth Paper Scissors' new publication " Pages". here is some of the art I have been making while in Cedar Key. This is a small quiltie that I made for my friend Jane. This is her and Glyn's cottage on Palmetto Drive. That's Evie sitting by the mailbox. For Valentine's day I made these little hearts as gifts for my friends. You may recognize them from the Stitch magazine. Below are my watercolour paintings made for the Sketchbook Challenge, " Close Up". A close up of a potted plant on our screened in deck over looking Goose Cove. A Hibiscus plant in front of the cottage. A small bowl found in the cottage was a challenging subject for a watercolour. Close up views of a shell. Close up views of a Live Oak leaf and acorns. Close up of a hibiscus leaf. And finally a close up photo of a talking parrot inside the Suwannee Valley Quilt Shoppe. For the time I have spend here in Florida, I have been printing on fabric using my paintings for inspiration. I am using Janet Edmonds book, From Print to Stitch as my resource. this is such an excellent book! 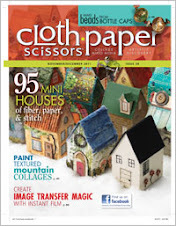 I have been busy visiting a couple of Quilt shops, JoAnn's Fabrics and ordering online! JoAnn's online shopping is incredible, I hope they deliver to Canada! Until next time, sooner than later, I hope! Your sketchbook pages look wonderful Donna. The quiltie makes such a lovely present for your friend and the hearts are great. Oh dear, I have been thinking about Janet Edmonds' book for a good while but have managed to resist so far. I can feel myself weakening. Lots of beautiful work Donna. I especially love the 'under leaves' sketch for close-up. Fabulous! Hope you're well rested and enjoying the last bit of your winter get-away! Looks like you've been very busy while you've been on holiday. Love the hearts!